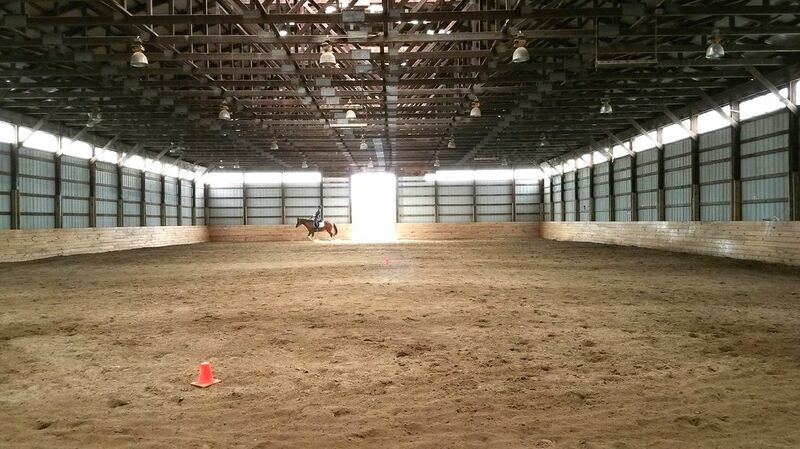 Phase one of our indoor arena renovation is done! Our indoor was built in the 70s so its important to keep up with maintenance. All of our posts have been inspected to make sure structurally the indoor is healthy. Once that was done, the new kick boards went in giving the ring a fresh young look! In addition, all of the skybelting was replaced. Our already bright arena now has tons more natural light streaming in! ​We arent done yet, but at least the biggest part is complete. Next month the stalls in the stabling area next to the indoor will be powerwashed and painted. Completeing that will open up more stalls for a few more boarders. Its been nice to have these empty during renovation to be used for storage. Then, all thats left to do in the indoor is hang mirrors, refresh the footing, and build the viewing room. We are getting there! Our very beloved instructional horse, Whisper, turns 30 years old this month! So, April is Whisper month! We are celebrating with her everyday in the month of April. She will have a new hat and a different treat for everyday this month. 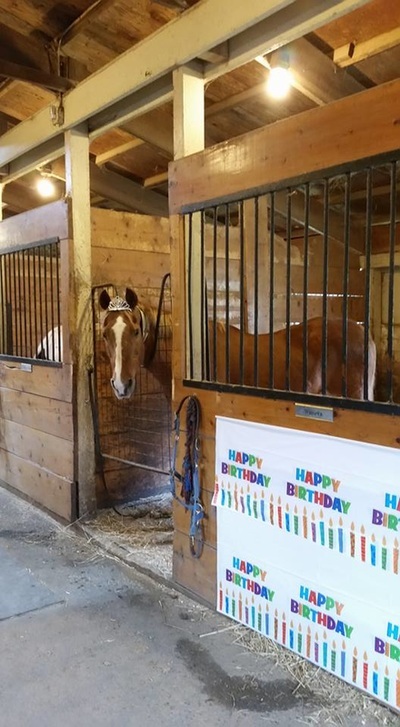 Stop by and show her some extra love and help her celebrate turning 30! She is really enjoying all of the extra attention, and of course the special treats. Introducing Pumpkin! 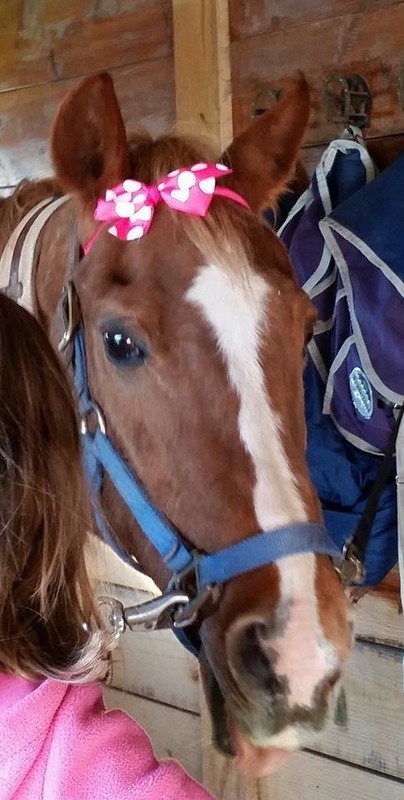 She is the newest member to our instruction horse squad! After a 2 month trial to make sure we were a good fit for each other, we have decided that Pumpkin would indeed be a great addition to our family! The is super cute, super quiet and super sweet! Many of you have already been riding her while she has been in on trial....but now it is official. We are trying to purchase a great teaching tool for the lesson program! It's an auto tracking video camera that will work indoors and outdoors. Here is a link to show you what we are trying to purchase: https://www.indiegogo.com/projects/world-s-first-indoor-outdoor-auto-follow-cam . This is brand new technology and will be an incredible teaching tool to add to the barn. This device will eliminate the need for an extra person to operate the camera and also those hard to watch, out of frame, jumbling all around videos that we sometimes get when a person is operating the camera! This will follow, and zoom in and out automatically giving the rider great feedback when they review their video. If you would like to help, it is super easy. Just go to https://www.yankeecandlefundraising.com/ , scroll down to where it says "start shopping" and enter our group number which is 990077608, then click start shopping. It will take you right to Yankee Candles current catalog! 40% of your purchase price will come back to us to purchase this great teaching tool! Thank you so much for shopping and helping us to acquire this great teaching tool!!!! Annual Food Drive Begins Now! It's time for our annual fall food drive! Here at Biamonte Stables we feel strongly that it is important to have a positive impact in our community. We can help by donating what we can to help our neighbors keep food on the table. Many of our neighbors struggle to make ends meet in the current economic climate. Every year we collect nonperishable food items at the barn, then deliver them to our local food pantry in Doylestown http://www.bchg.org/food-pantries/ . We hope you will help by donating what you can. All you have to do is drop the food off at the barn and we will take care of the rest! What to donate? Anything nonperishable, like peanut butter, soup, cereal, rice, boxes of pasta, spaghetti sauce, gravy, jelly, baby food, baby formula, sugar, flour, personal hygiene products and more. We hope you will help us, help others. Together we can make a difference! Loving Being Back In Bucks County! We are loving our new home in Jamison! What a great location, so close to everything yet so quiet and peaceful. We are only minutes from 3 tack stores, every kind of food imaginable, grocery stores, department stores...you name it. Plus, so easy to get to from routes 202, 263 and 611. So many people have stopped in to say hi and welcome us back! It has been so great seeing everyone and so nice to have all the well wishes. We have reconnected with many people that we hadn't seen in a while since our move out of the area. There have been lots of new faces too! We have had a lot of new lesson students join us over the past several weeks. There is a great, happy energy in the barn and we love it! We have been very busy updating and improving the farm. It had all the necessities and was in good working order when we moved in, it just need ed a little freshening up! The first thing you will probably notice is the fencing has already been repaired. Just under 300 rails were replaced and a bunch of posts. Now the fence line not only looks better but it is safer! Not so obvious is all of the cleaning and cob webbing that has been done. There's lots more of that to come. It's a never ending battle to keep up, let alone catch up in a barn. Lorri's office has been totally redone with fresh paint, new floor and new exterior door. She's not done in there yet but at least it's clean, comfortable and in working order! You may or may not have noticed how much pruning and mowing has been going on. A lot of the trees had been taken over with various vines. We are working on clearing that up. We have made quite a dent, but have had to put that on hold until after summer....too many bees stings told us it was time to quit. We think the trees are feeling much better however with the progress that was already made. In addition ,the back acreage has been completely mowed for the first time in years apparently. It was over grown with wild roses, small trees and weeds. It looks better already after one mowing. We can't wait to see it after another mowing or two this year. The hope is that it can become a hay field for our horses. The cross country course got a little weeding and pruning as well just to neaten it up a bit out there. There's more work to come for that as well. The bathroom is in mid repair. The temporary clean up and paint is finished and now we are waiting on the partial renovation of one wall and floor. It looks so much better already. Eventually it is getting an expansion and total renovation. There is lots more to do and we are looking forward to all of the improvement. Yet to come this year is the barn will be painted to match the indoor arena, and some tree work. Next spring we need to start to tackle the landscaping. So if you are working in your garden this fall and next spring, and have plants that need to be divided or re-homed, please think of us. We are looking for low maintenance perennials, sun and shade loving, that are deer resistant. The plan is to put a perennial bed at the entrance on the left side of the driveway and the beds close to the barn. It is bitter sweet that we announce our move back to Bucks County! A little over a year ago we moved to NJ, to Black River Farm. At the time there weren't any suitable barns available in Bucks County. Now that one has become available, it only makes sense to return as most of our riders live there. We have loved our time at BRF and can't thank everyone there enough for welcoming us into their amazing facility and for making us feel so welcome! We have met so many wonderful people and made many new friends while we were there. Now, we are excited to start this next chapter at Edie Spruance's farm in Jamison PA, formerly know as Fairwoods. This farm has a rich, robust history and we are honored to be it's next stewards. We look forward to carrying it's legacy forward. We expect to be moving mid May and hit the ground running with no interruption of services. Our new home has everything we need to provide quality care, training and instruction with a quiet, relaxing environment. It also has more stalls which allows for expansion. We will begin taking new boarders June 1st 2014. 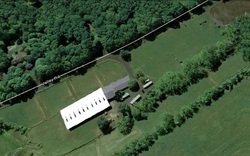 The farm offers nice roomy stalls; great ventilation and natural light; indoor arena; outdoor arena and more. Our new address will be 2334 Valley Rd, Jamison PA 18929. We are pleased to announce that Lorri has found her new competition partner! 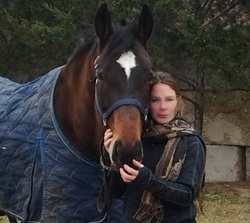 Lorri was taken out of riding and competition by a non horse related neck injury several years ago. 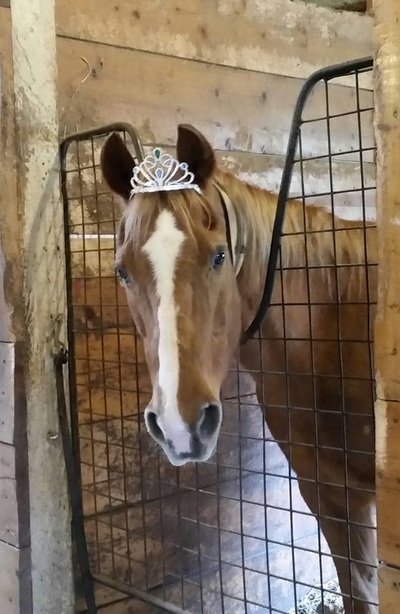 Once she took the necessary time off to put herself back together it was time for her competition horse, Shanelle, to retire into a more relaxed job as instruction horse at Biamonte Stables. Since then Lorri has been looking for the right horse! It couldn't be just any horse. Lorri needed a advanced level horse to break into the international ranks of dressage competition. Just this winter one has come along, Fyn. Fyn had been doing so well in his competition career. He was steadily progressing becoming an even better and more advanced competitor with every year. Lorri had admired him as others rode him. She thought what a good natured soul he was, and admired what a lovely and talented horse he was. Never in her wildest dreams thinking that she could afford him. Unfortunately, Fyn sustained an injury. Horses do that sometimes no matter how careful you are with them. So now Fyn found himself facing an extended period out of work, needing a long recovery and rehabilitation. Fyn need someone to take a chance on him. Who would take on this horse's rehabilitation with no guarantees of a full recovery? So their journey begins. Having just really met, they take the first steps back to competition together. Lorri and Fyn....and our team. It takes a lot of people and support to get a horse and rider into the competition ring. If you would like to follow their journey back, Lorri has created a blog just for this process. Just go to http://www.teambiamonte.com/ and be a part of their come back!